Though short, variety is the buzz word for this loop tour. It begins with the standard route to Berts Lake. It then descends a steep slope to where it intersects the road that leads to Chipmunk Bluff. It ends by following the road back to Loon Lake Chalet where the tour began. Along the route you are treated to grand views of Chipmunk Bluff, Tells Peak and the Crystal Range, and of course Loon Lake. But that's not all. Two short extensions are also possible. One is to the summit of Peak 6836 that commands an impressive 360-degree panorama. The second is the gentle tour out to Chipmunk Bluff. Put it all together for an outstanding day of backcountry skiing. There are two trailheads adjacent to the Loon Lake Chalet. 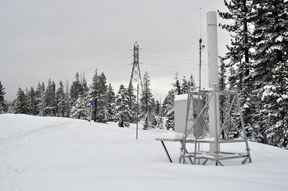 This tour begins at the SMUD rain gauge on the southwest side of the the Chalet and ends where the road leaves the Chalet to Chipmunk Bluff. Traverse around Peak 6836 for 0.7 mile until you reach Berts Lake (5). The marked trail in this section stays level until it is east of the peak and then climbs. Peak 6836 is 0.1 mile and 100 feet above to the northeast. 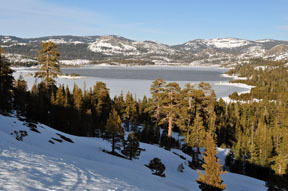 Ski to the north end of Berts Lake and then pick the best route down to the southwest for a total of 0.2 mile until you reach the road to Chipmunk Bluff (6). 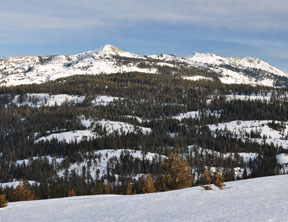 Chipmunk Bluff is 0.5 mile southwest (left) on the road. 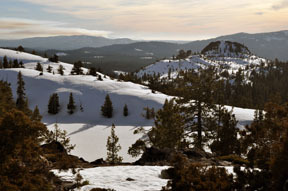 Ski north (right) on the road for 0.8 mile until you reach Loon Lake Chalet (7).